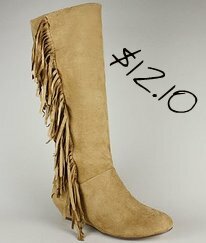 GoJane.com is one of my favorite online stores for affordable apparel and footwear. Through my daily briefing of New Arrivals I came across a great pair of boots for only $12.10. Fringe is definitely "IN", but these can be worn in any season. Pairing them with a cute pair of shorts in the summer or some leggings in the fall, these are "Great Buy". Hurry there are various sizes left but I am not sure how long that will last. For $12.80, I definitely could use these! Great tip!